This entry was posted in Demo, SWT. Bookmark the permalink. I liked that web based google talk..
really good interface.. 4 chat.. Yes, a lot of works need to be done before it becomes an application or a service. The programme is so good. but UI is simple. Reorganizing the interface is better. O, the UI is Google Talk’s things. Just a complete copy. Oops, great work…., really great… keep rocking…. 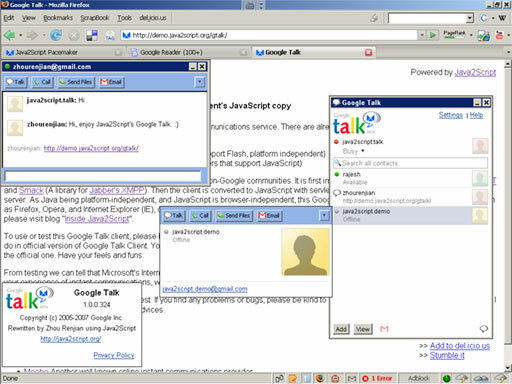 Now the Java2Script Gtalk demo should be working. Try it out. Thanks for pointing out CPU problem. From our tests, CPU is not a big problem. Would you like to provide more information about your environment, including CPU, memory and browser. We frequently review and modify our program for a better web instant messenging user experience.